A couple of weeks ago, I was visiting a friend’s cottage & when we arrived, I was startled to see this gal lazily hanging over the bird feeder. Her name is Glue (I am not certain why). My friend is like a living snow white, feeding the animals surrounding her cottage. When she steps outside, creatures appear from everywhere, in hopes of a receiving a little snack. Glue, comes in once a day, to receive her peanut butter sandwich. Apparently she had just eaten, which explains why she feeling so lazy! This entry was posted in Uncategorized and tagged Weekly Photo Challenge. Bookmark the permalink. Yes … I get surprised by those little bandits on a regular basis. There is a party of 5 that like to throw impromptu get togethers on our deck. Oh dear, that can’t be a good thing! No, it’s not. The little brats have the audacity to hiss at me when I break up their party. Hahaha! I am not kidding Jodi, I have never seen anything like it! Animals chatting away to her as soon as she steps outside…it’s quite something! Yes, she is pretty cute! Amazing shot! Very cool to have a relationship like that! Thanks “A”. It is interesting to watch, that’s for sure! Oh goodness, this is my “happy” for the day!! I know! Too bad they are so destructive, her face is adorable! So cute and hopefully glue isn’t looking to hibernate indoors! We currently have a squirrel that thinks our dryer vent is his new high rise condo! Oh no Sue! Chipmunks can be a nuisance as well. As cute as they are, they have cost my father-in-law about $800 on two separate occasions, from chewing wires under his car. I would agree that I am not sure I would be encouraging Glue as my friend does, for fear of her taking residence in the cottage! She did make for an awful cute picture! Hope you are are able to evict your squirrel soon! I hope so too Lynn. The wee visitors aren’t looking quite so cue these days. Ha! So cute Lynn. Glue looks pretty young yet, I hope she doesn’t create problems in the future. Raccoons can be destructive and bad natured. Yes, I agree Paul, raccoons can be very destructive. Not sure I would want her hanging around as closely but I they don’t seem to have any problems with her & she doesn’t display any aggressive behaviour. Trust me, I was very cautious of her when I took this shot. She has been around for awhile & is actually quite old.. My friend fears this will be her last year. That is cool Lynn. If she has been fine so far then I’m sure she won’t change. Too many people think wild animals should be warm and cuddly when they are not naturally that way. Yes, this crossed my mind as well. I am not certain why she came up with that name, I will have to ask her. Knowing that she would never hurt a living being, I am certain she must have a good story as to why she gave this gal a name like Glue! Glue an appropriate name for they tend to hang around where the food is. Look at those eyes. Adorable looking bandit. Ours go swimming in the pool late nights. So true! Despite how destructive they can be, they do have an adorable face! 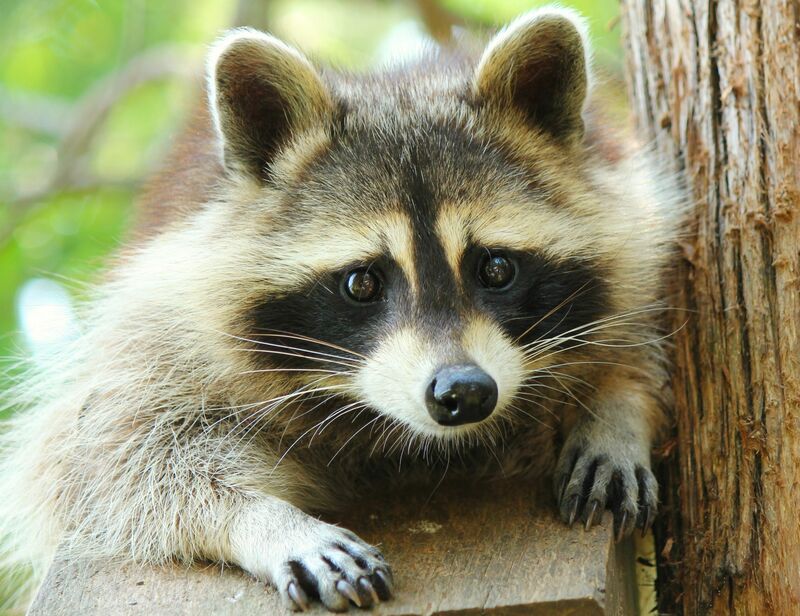 Healthy looking racoon – must be a whole wheat bread! I think she is a white bread girl, must be all that starch! Only if you are Snow White! so cute!! amazing shot too!! I was so shocked to see her so close up! She, on the other hand, seemed quite comfortable! I love what I am seeing here on your blog. Dynamite header for this website. You have a new follower! Thank you so much for your kind words & the follow!